Skip to the bottom for the challenge if you’re in a hurry! 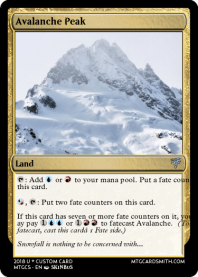 The Challenge: Make one, two, or three two card pairs (front and back) using the Fateshifted mechanic Fatecast from my casual set Fall of Smiths! This one will take some explaining, so read carefully and ask questions if you need to. Fatecast cards are double sided cards. 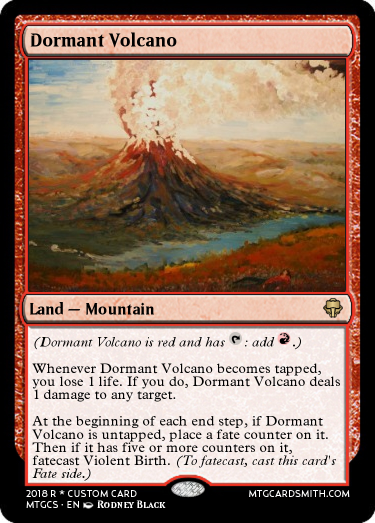 The front side is a permanent, which means an enchantment, artifact, creature, land, or, if you do so dare, a planeswalker even. The back side, however, will be an instant or sorcery with the subtype Fate. If you are using variant 2, or want to make variant 1 instant speed, make its backside an instant. Otherwise, make it a sorcery if you want Variant 1 to only happen as a sorcery. You will cast Ominous Bell face up like it’s a regular artifact. 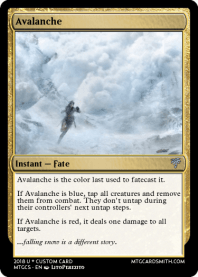 Then, when you’re ready to pay the fatecast cost, you may cast the card’s reverse side. However, since it’s a sorcery, you must wait until a time you can cast a sorcery. Then, when you cast it, the permanent will no longer be on the field. 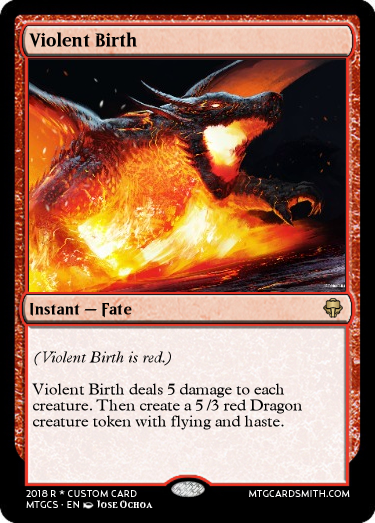 The card will be whatever the reverse side is, in this case, Death Toll. It will be treated as a spell on the stack, resolving, then going wherever it would normally go. Remember! Good cards get the ultimate reward; a favorite, their card featured in the set, and maybe even a follow! @LyndonF Awesome! You nailed it right on the head! Hmm... Two Weeks without an entry. Is the set name deterring anyone? Because trust me... I'm... probably... not a homicidal maniac. You need to bump your contest/challenge with content so people don't miss that it's there. I noticed you haven't bumped it in a while. Better late than never, right?... right? Due to an apparent lack of interest, I am going to start a countdown for closure. If no one else enters by Oct. 7th, I’ll end this segment of Fateshifted Mechanics. Oof. At that I’m going to have to call this challenge abandoned.